Raven's Wing has fine silver shimmer in a black jelly base. Raven's Wing is ooold, as polish goes. 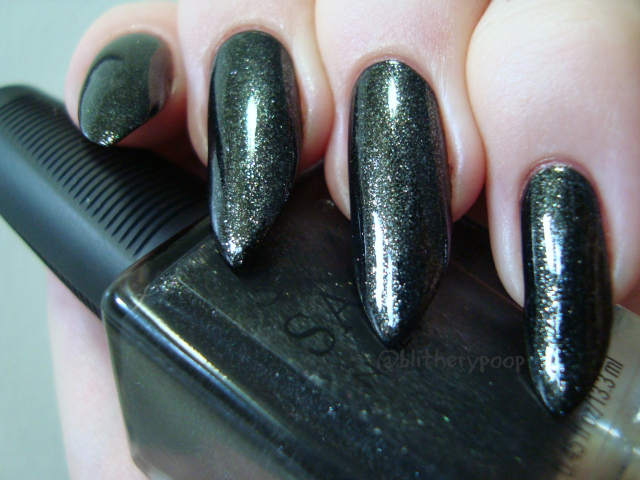 It's from Sally Hansen's Fall 2008 Designer Collection. When I saw it on NB a year or two ago, I had to have it. It took repeated internet searching, a little luck, and more than I usually like to spend, but it's been mine for a while now. Halloween is a great excuse to wear it. This is two coats over black undies, because it's sheer and slow to dry. Layered over black like this, it almost looks like a black foil. It's completely gorgeous and worth tracking down, especially if you're a collector. Sinful Colors Secret Admirer is similar, but the base is more opaque and the shimmer is more obviously silver. Even holding these older, square Salon bottles is like time travel for me. Funny how things like that can take you back. Wow, there is no black polish with black shimmer. Huh. I don't think I've ever given it any thought. It seems like it would be a common thing. Maybe there are some indies that would be close, I honestly have no idea.